MBTA Commuter Rail trains are back on schedule Wednesday, a day after a train carrying approximately 800 passengers derailed in Waltham. Tuesday morning’s commute was interrupted when MBTA Commuter Rail Train 404 on the Fitchburg Line was involved in an upright derailment at about 8 a.m., according to Keolis. The derailment caused major delays for travelers. The emergency prompted inspections of all train cars with the same equipment before the Tuesday evening commute, Keolis said. No additional problems were found. Zak Keley was on the platform at Waverly Station waiting for the 8 a.m. train when he first noticed a problem. "They apparently gave the people the option to get off and walk down this stop or stay on," Keley said. A crowd of commuters walked toward his direction on the tracks. Those who did not waited nearly two hours for transport. "That was the first time I’ve seen something like this happen." Keley said. "It was like a bump and then it kind of was leaning to one side," one passenger told NBC10 Boston. "One of the passengers said she thought she saw like a fireball or something." The witness said a quick-thinking passenger alerted crews while another pulled the emergency brake. 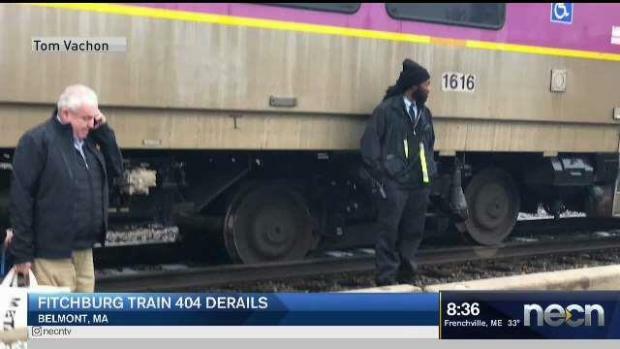 A spokesperson for Keolis, the company that manages the MBTA Commuter Rail system, says the train’s conductor also pulled an emergency brake. 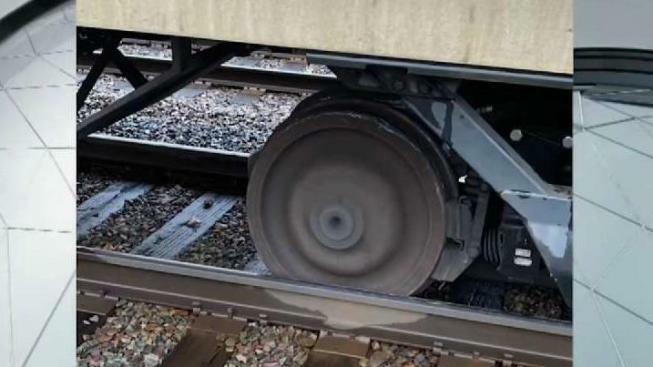 The issue was initially reported as a mechanical one by Keolis on social media. The exact cause remains under investigation, and the train is now quarantined at a Somerville terminal until mechanics can repair it. A replacement train will take its place.